The rhythmanalyst will not be obliged to leap from the inside to the outside of the bodies he observes; he should be able to succeed in listening to them together and allying them, by taking his own rhythms as a reference: by integrating the inside to the outside and vice-versa. 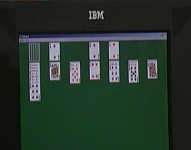 In an astonishing sequence from the video installation Corridor X, the scene shifts abruptly from a Eurovision control monitor to a make-up session under the eye of the cameras, then to a room full of TV reporters, then to a computer screen where someone is playing solitaire. 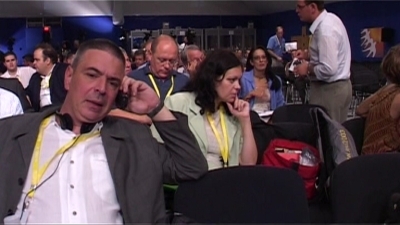 We are in the official media center of the European Summit of Thessaloniki in June 2003. Outside, a huge demonstration has gathered in opposition to the European Union, to the war, to globalization. Inside, everything is ordered, ranked, segmented: politicians deliver speeches, translators pipe them into headphones, reporters clip out news bites for their stations. Security passes dangle from color-coded straps around each person’s neck, distinguishing name, access level, function. The gaze returns insistently to the control monitor, connected to four video feeds transmitted directly by cameramen outside. Feed number 4, which is going live on the air, shows the police in pursuit of black-clad anarchists; but an instant later we ourselves are thrust into the surging crowd of demonstrators, we feel their movement in our bodies, we are carried off in their flight. The sequence from Corridor X seems to echo or respond to another one toward the end of the Black Sea Files. This time we are in Turkey, at the site of the historical divide between Occident and Orient. On the left-hand screen, an immense oil-tanker navigates through the straits of the Bosphorous: suddenly it is caught in a viewfinder and keyed into a digital map. On the right, we see the control panel of a computerized system for maritime traffic surveillance, installed at enormous expense to guarantee security during the passage of the tankers through the straits. Over the soundtrack comes a crackle of radio transmissions against a barely audible background of oriental music. Then the view of the control panel flicks to a satellite image of Istanbul. As though the video-maker, once again, were inquiring into the nature and function of the technologies of vision, the condition of the world-on-a-screen. Yet this is a project that speaks. To instill a dialogical character into the very production and editing of the investigation, Angela Melitopoulos constituted the group Timescapes, including the VideA collective from Ankara, Freddy Vianellis from Athens, Dragana Zarevac from Belgrade, and the German video-maker Hito Steyrl who filmed the European summit in Thessaloniki along with Melitopoulos herself. Another participant was the professor of media art and cultural studies, Ginette Verstraete, who accompanied the project of Transcultural Geographies from its inception, along with numerous other artists, theorists, inhabitants and experts who contributed their images, their voices and their texts, or who participated in one of the four project seminars held in Amsterdam, Ljubljana, Istanbul and Zurich. All this was documented in a book, and given spatial expression in the two exhibitions of the project mounted in Berlin in 2006 and in Barcelona in 2007.3 It was, to date, one of the most searching and insightful projects of what some people are calling visual geography. These precisely conceived investigations of the southeastern periphery of Europe, and of its continual transformations since the end of the Cold War, take us far away from any purely aesthetic definition of art. The ambition is clearly to develop a new mode of inquiry and expression, yielding results that are qualitatively different from those obtained either by artists or by social scientists. As Ursula Biemann remarks: “In my understanding of the practice of art, images and text are inseparably interwoven in their common purpose to produce knowledge.”4 But the question is, what kind of knowledge? All the works in the project are carefully researched, yielding a synthesis of existing disciplinary studies; and particular efforts have been made to to integrate the precise distinctions of the social sciences into a broad and consistent narrative. Yet there is also a critical examination here, not so much of the “text/image relation” that formed the semiological stock-in-trade of concept art, but instead of the more pragmatic confrontation between analytic discourse and cultural performance. Analysis, in short, is brought up against the lifeworlds of Southeastern Europe. And while the discriminatory power of objectifying analysis reaches deeply into the existential singularity of the encounters – and into the warp and weft of the video editing – it also serves to bring out a fundamental heterogeneity. One could say, in the spirit of French philosopher Henri Lefebvre, that the logic of capitalist rationality is inscribed into the sensuous material of art, and that the incongruity of the two points beyond the informational level of representation, toward other human realities whose promise is rarely voiced. Let’s focus for a moment on the heterogeneous nature of representation itself as it appears in these works. At the initial level – whose social importance can hardly be minimized – we are squarely within the classical paradigm where the verbal or visual sign not only stands in for the referent, but also serves as an ideal model or template for its transformation. Thus the “objects” that are treated (the pipeline, the transportation net) must be read as the material emanations of a highly abstract process of corridor planning, which extends the infrastructures of capitalist production from the fully saturated historical centers (the “A Zone,” in the jargon of the technocrats) to the peripheries which can still bear heavy capital investment (the “B Zone”). It is in this sense, at least from the planning perspective, that the southeastern periphery is gradually “becoming Europe,” as it is ever more deeply integrated to the infrastructural net that constitutes a full-fledged capitalist production circuit, from extraction all the way to processing, finance and markets. Corridor X, leading from southern Germany into Greece and Turkey, can offer a perfect example of this kind integrating infrastructure, with its central axis and its diverging branches, its 2,500 kilometers of roads and rails, its twelve airfields and four ports, most of which which already exist in scattered pieces and yet remain to be forged into a functional whole, via private-public partnerships of tremendous stealth and complexity.5 This kind of project seems calculated to dwarf the human being, and in that way, to vanquish in advance any imaginable resistance or possibility of democracy. Yet by a chance linguistic twist, the Roman numeral “X” that is supposed to represent this immense infrastructure is also a perfectly conventional designation of its fundamental lack of meaning, its absence of ontological density – at least when it is viewed through the mathematical lens of the planners. The segmented void of the corridor can only be transformed by the fluid diversity of its users, who alone will provide the project’s real motive forces. The BTC pipeline presents a similar aspect. Today it is already buried beneath the ground, to secure it against terrorist attacks, but also to reduce its exposure to the media. It was only visible for a few short years, during the period of its construction; and even then, you had to find it on the terrain, since the British Petroleum corporation gave no information whatsoever as to its location. But one can ask if such a project could ever truly be “visible,” or if it does not rather consist in the informatic space of coordination and control that assigns it its real functions. Biemann raises this question throughout the film, for instance when she shows the image of the oil-tanker in the viewfinder; but she also turns her gaze elsewhere, along the full length of pipeline, to engage in conversations with the workers, the farmers, the experts, the prostitutes, the refugees, all those shape the space of this infrastructure, even as they are shaped by it. Ultimately, it is the human environment that forms the subject of the film. Thus a different level of representation becomes increasingly palpable. The other side of the pipeline – all that is “beyond” its abstract functionality – rises gradually into our field of knowledge through this questioning relationship with the people along the wayside, often migrants, displaced persons, who know what it means to have to recreate a world. The critical examination of the relation between analytic discourse and cultural performance is now turned on the “I” behind the camera, that is, on the subjective position of the camerawoman herself. Her memory and its particular association to a place becomes the material that the artistic research probes. Reflecting on the same scene in her writing, she formulates one of the project’s fundamental goals: “It is not so much the capturing of a spectacular human drama that is at work here but the relentless search for the uncontrollable shoots of buried histories.”7 What the artist begins to add to the classical formats of geographical representation is an inquiry into the texture and temporal depth of the relations that produce the videographic flux itself – a dialogical texture, brimming over with contrasts and differences, yet always somehow uncertain or inconclusive, and partially opaque even to those who bring it concretely into being. Lefebvre’s philosophy, in The Production of Space, is turned entirely toward the conceptualization of this differential creativity, in its distinction from the sterile infinity of abstract serial production. Yet today one can go further than the sheer concept of differential space. Between Lefebvre’s time and our own, there has been an immense flowering of feminist inquiries and postcolonial historiographies, which have brought particular attention to the interactions between the positionality of subjects and the forms of situated knowledge (including expressive knowledge).9 These interventions have awakened the desire for a new treatment of representation, a multiplication of its gestural and narrative textures: for it is these textural elements, with their transindivdual dynamics, that are directly productive of human perception, and thereby, of the very capacity for the creation of space. Extending the pathways opened up by feminist and postcolonial theory, certain artists working with contemporary media have sought a more active and affective intervention into the production of space, by means of the material and linguistic qualities of videographic editing itself. Instead of a pure analysis of abstract space or a pure aestheticization of the human landscape, artistic research can now give form to a differential geography, that is to say, to a mode of cognition – and of recognition, and of self-recognition – that allows subjects to inscribe their own positionality into the gestural texture of the narrative, exposing the socioeconomic determinants of their lives to the flux of intersubjective time, and to the electronic fluctuations of the video image. Through such a process the controlled and segmented spaces of the multimodal corridors can become a fluid realm of expression and exchange, a sensuous and dialogical field, able to convey the contradictory resonance of multiple threads of historical experience and unanchored desire. And through this differential representation, the perceptions and perspectives of the B Zone – which Melitopoulos describes as “a zone of transitions, processes of becoming, unstable political conditions, neocolonial strategies of cooptation and antithetical historiographies”10 – can start flowing back into the saturated imaginary space of the A Zone, and begin to create a field of coexistence. This is the active force of differential geography. The Timescapes experiment is an attempt to provoke this movement of reflux, through a set of protocols, a technical device and a highly original practice of editing. The participants, who filmed along the routes of Corridor X and beyond, accept to place their results in common, constituting a stock of video images which each then receives back as a collective memory bank (around 25 hours of rushes). Each video-maker then works in an isolated studio; but a specially conceived Internet platform allows the editors to share the timecodes of their cuts with all the others, and to relay any additional material such as subtitles, image overlays, supplementary scenes, etc. In this way, the editing software can reconstruct every new sequence from the raw material stored in the memory bank, so that at any given point in the process, each one can see the video that the other is in the midst of creating. A billboard function allows everyone to post observations and commentaries on their reciprocal borrowings and contrasting narratives. What this amounts to is an invitation to experience the other’s construction of reality as it unfolds, and to integrate that experience as a troubling, inconclusive element within one’s own expression. As Melitopoulos wrote to one of the other participants, the Turkish video-maker Oktay Ince, “I tell you something about how I feel becoming a part of your editing: can you explain to me, how I as a person am going to be the material for a psycho-graphic line of yours? What of me becomes part of your movie?”11 In the space of exhibition, this reciprocal appropriation becomes an astonishing experience: from gallery to gallery, from monitor to screen, the images and soundtracks reappear, echo one another, diverge and recombine again. And yet this echoing, divergence and recombination is one of the best available translations or prolongations of the ways that cultural history is really made, on the grounds of a trans-subjective territory. For Melitopoulos, non-linear editing means working with the durée, the time of our consciousness: a modulation of the attention that informs our memory, our thought and our spatial awareness. As she writes: “The video image does not document the real, but acts as a mnemonic agent or a visual memory.”12 What results when these mnemonic agents are combined is a kind of phrasing of being in the landscape of time, bringing memories from the past to the surface of the present and mingling them with the experience of perception, in close relation to the sensibility of others. Following this inspiration – which is deeply influenced by Maurizio Lazzarato’s vidéophilosophie – she constitutes a moving picture of Corridor X in which multiple layers intertwine: her own travels to her father’s homeland of Greece during the summer vacations of her childhood; the construction of the Berlin-to-Baghdad railway in the early twentieth century; the digging of Loibl tunnel by conscript labor during the Second World War; the mobilization of the Yugoslav population for work on the Highway of Brotherhood and Unity; and the actuality of Corridor X, where technical information and political events weave their way into the gestures and voices of those who experience the impacts of the planning process on their everyday lives. Could there be any higher ideal for practitioners of video recording and non-linear montage? Like Charles Baudelaire in his “petits poèmes en prose,” Lefebvre gleaned his inspiration “from frequent contact with enormous cities, from the junction of their innumerable connections.” Indeed, the polyrhythmical metropolis of the nineteenth and twentieth centuries was the great resource of differentialism and multiplicity. The works of the “B Zone” embrace a larger scale, extending the rhythmanalysis of the city to an entire region and its history. A politics of precise and detailed information is exposed to its affective and dialogical dimensions, in a process of trans-subjective editing that traverses a continent. Aspirations like these most often arise from moments of crisis. Here we should think of the first Gulf War, contemporary with the appearance of CNN. At the time, Melitopoulos shot videos in Paris for an activist project called Canal Déchaîné (Unchained Channel), which involved people carrying radical video monitors, complete with battery pack, on their backs through demonstrations in the streets. The Internet platform of the Timescapes project strives toward a future in which images from across the earth can be recombined amidst the urgency of the event, not into the one-dimensional characters of an impoverished subjectivity, but into the rich and contrasting textures of a collective self-reflection that can endure through the awesome shockwaves of idiocy that militarized capitalism now imposes on us. The point is not simply to send a clip around the world; it is to begin responding to the challenge of flatly imposed universals with the alternative of interwoven landscapes of becoming. Ursula Biemann’s work, to this date, has sought no such technological mode of distribution or interactive editing. Yet the production of her videos as multiples, costing the price of a book rather than that of a limited-edition video artwork, means that these visual narratives get around, contributing both to cultural education in the diffuse sense and to the more focused encounters of activist groups concerned with a particular issue. There is a palpable need for this kind of image-production. The fact is that sustained artistic research into the gendered and ethnically hierarchized worlds of uneven geographical development does not yet exist to any massively significant degree – no doubt because it cannot be planned like a pipeline or a corridor, but must instead emerge from the cultivation of desires for a more meaningful mobility. The whole point is to support this cultivation of desire, in the face of instrumental programs that have no need for anything but their own results, the tautological fulfillment of their functions. As the struggle over oil resources drags our planet ever deeper into war, and the extension of Corridor III is planned all the way to China, this effort to breathe some life into the abstraction of global infrastructures may prove to be the real challenge of the twenty-first century. 1 Henri Lefebvre and Catherine Regulier-Lefebvre, “Portrait Prévisionnel du rythmanalyste,” in Éléments de rythmanalyse (Paris: Syllepse, 1992). An English translation has been published by Stuart Elden and Gerald Moore, under the title Rhythmanalysis: Space, Time and Everyday Life (London: Continuum, 2004); but here I preferred to retranslate from the French. 2 Anselm Franke, “Introduction,” in B-Zone: Becoming Europe and Beyond (Barcelona: Actar, 2005), p. 7. 3 The exhibitions were held at KW Institute for Contemporary Art, Berlin, Dec. 17, 2005 – Feb. 26 2006, and at Fundació Tàpies, Barcelona, March 10 – May 1, 2007. 4 Ursula Biemann, “The Black Sea Files,” in B-Zone, op. cit., p. 25. 5 For official information on Corridor X, seee, among others, http://edessa.topo.auth.gr/x. 6 Ursula Biemann, “File Four,” in Black Sea Files, 43’ 47”, 2005. 7 Ursula Biemann, “Black Sea Files,” in B-Zone, op. cit., p. 59. 8 Henri Lefebvre, The Production of Space (London: Blackwell, 1991/French ed. 1974), pp. 395-96. 9 Cf. Irit Rogoff, Terra Infirma: Geography’s Visual Culture (London: Routledge, 2000), particularly chapters 1 and 3. 10 Angela Melitopoulos, “Timescapes,” in B-Zone, op. cit., p. 144. 11 Angela Melitopoulos, “Corridor X,” in B-Zone, op. cit., p. 168. 12 Angela Melitopoulos, “Timescapes,” in B-Zone, op. cit., p. 140. 13 Henri Lefebvre and Catherine Regulier-Lefebvre, Rhythmanalysis: Space, Time and Everyday Life, op. cit., p. 89. 14 Angela Melitopoulos, “Timescapes,” in B-Zone, op. cit., pp. 140-41. 15 Angela Melitopoulos, “Timescapes,” in B-Zone, op. cit., p. 145. 16 Alexandre Zdravchovski interviewed by Angela Melitopoulos in Corridor X (2005), transcribed in B-Zone, op. cit., p. 229. This entry was posted on January 26, 2008 at 12:53 am and is filed under 1. You can follow any responses to this entry through the RSS 2.0 feed. You can leave a response, or trackback from your own site.